Sweet Assassin: Oly Oly Oxen Free! 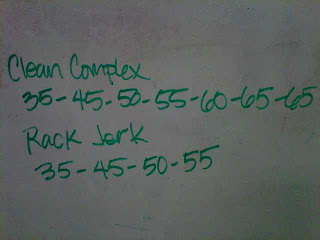 I've been wanting to attend Tuesday night's Olympic Lifting Class by Chris Mello since its inception a few weeks back. I finally got a Tuesday night off after much finagling with those at work (god, I hate that place). We started with the Junk Yard Dog Warm up that go me all revved up. It was great. Mello then jumped right into the lesson starting with the Burgener warm up with the pvc, then into the clean progression. We did it all over again with a just a bar with no plates- I chose the 15# bar. The clean complex was the 3 movements strung together without letting go of the bar. I really liked it. Mello didn't feel I needed to get to my 1RM weight (75#), but to really work on my speed and technique, so I maxed out at 65#s doing sets at that weight. 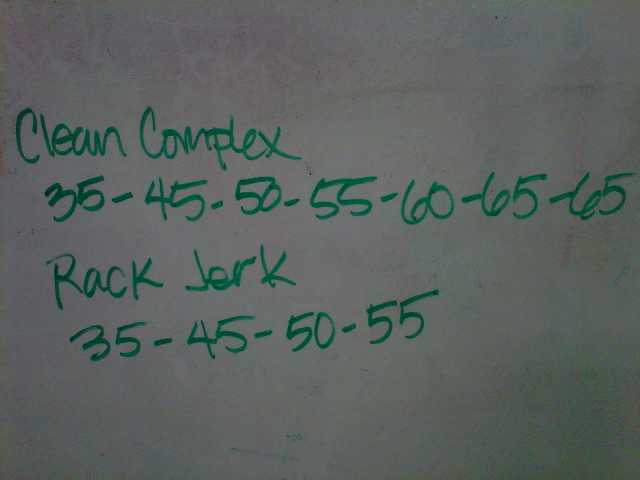 The Rack Jerk is something I need to work on, specifically on my landing, it's a bit soft and not solid. But I feel my jump-jerk speed is good. I feel solid with the weight above me, meaning my core is solid and engaged, but for sure my feet are "slippy" if that makes any sense. I really really really really want to have it where I have Tuesdays off from now on so that I can attend the Oly Lift Class on a regular basis. I'll talk to Cole and Ricky about it. Orrrrrr, I could just land a regular schedule job and escape the hell that is Hotel Shangri-la. Please please please please. Say it with me, "Bee-Brahms"